The Blizzard Alight 7.2 Skis + TLT10 W Bindings are the perfect learning platform for new skiers or those just coming over from rental gear, and make learning more enjoyable than ever. With a Woman Specific Design (WSD) and new light construction, the Alight 7.2 is ultra easy to coax into smooth turns and extremely forgiving for those with lesser experience. 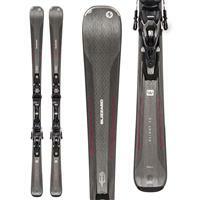 Rocker / Camber / Rocker – Ski profile with 6 mm of mild rocker at the tip and tail, and camber in the middle. Reducing the pressure on the edge at the tip and tail makes the ski easier to handle without sacrificing edge performance, while camber guarantees great grip on packed snow. W.S.D. Shape Concept – The sidecut of each length of each Alight model has been specifically designed to deliver the right level of performance and ease of use. W.S.D. mounting position is 5 mm forward on all Alight models. Light Woodcore – Innovative Alight woodcore of poplar and beech that's 10-12% lighter than before. Ultralight Fiberglass with Integrated Carbon Fiber – Allows a lighter construction that retains stability, torsional rigidity and rebound. IQ System – The IQ system is the only true fusion of ski body and binding element. The natural performance and flex of the ski are not influenced by any mounting, drilling, screwing or gluing of separate interfaces, elements or the binding itself. 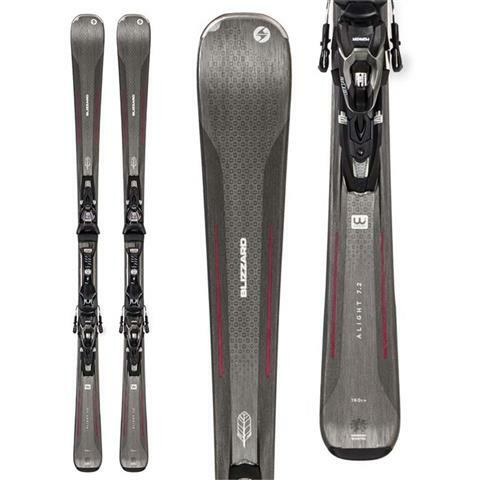 This exclusive technology guarantees natural ski flex, direct transmission of forces from skier to ski and a lighter construction for more effortless skiing and a fast, simple binding fit. *Bindings Do Not Come Mounted to Skis – Always have a certified binding technician mount and adjust your bindings.